Mozilla Firefox is without the shadow of a doubt the browser that you can customize the most. This shows not only when it comes to (most) feature additions or changes, as there is usually a way to return to the old, but also when you dive into the depths of the about:config page. The page lists a lot of preferences that you can all modify. Most are not accessible elsewhere in the browser, and you often find preferences listed here that Mozilla has implemented but not enabled yet for all users. While you find all kinds of preferences here, for instance options to change the color of link anchors, you will also find many security and privacy related preferences here. Making changes to those can improve security or privacy. The following list attempts to list all privacy and security preferences of relevance. With that said, it is a work in progress considering that there are that many preferences available. If you notice that a preference is missing, or discovered a new one, use the contact option here on this site to let us know about it and we will implement the change right away. Tip: you may also want to check our extensive Ghacks user.js file which is the best privacy and security preferences collection for Firefox. Type about:config in Firefox's address bar and hit enter. Confirm you will be careful if the warning message is displayed. The search is your best friend. Just start typing a preference name and Firefox will automatically filter the list so that only matching results remain. You can change preference values with a double-click, and create new preferences with a right-click and the selection of new from the context menu. Note that there is no way to remove entries from the list from within Firefox. Pro Tip: All bold preferences are modified preferences. The about:support page lists all of them. Sends data to servers when leaving pages. True: Feature is enabled and web apps can make use of it (default). Determines how often Firefox checks if a newer than cached version is available. The maximum space that Firefox uses for the disk cache. 0: Don't use the disk cache. 256000: default value in Kilobyte. Defines Firefox's use of the disk cache. False: Disk cache is not used. Defines whether contents of SSL (https) web pages get cached by Firefox on disk. False: Firefox will not cache https website contents. The maximum size of a single entry in the memory cache in Kilobyte. Whether a memory cache is used by the browser. True: Firefox will make use of a memory cache. False: The browser's memory cache is disabled and thus not used. The capacity of the offline cache. Needs browser.cache.offline.enable set to true. 512000: the default cache size in Kilobyte. Whether web applications and sites can use an offline cache on the local system. False: Offline cache functionality is disabled. This defines whether a warning message is displayed by Firefox when you click on an executable file in the download manager. False: Does not display the warning. 0: Immediately after the successful download. Whether Firefox will scan downloaded files with installed antivirus software. False: Files are not scanned. Defines whether Firefox's "fixup" feature is used. False: Won't use it which means that Firefox will always redirect to search, even for single word entries. The prefix that Firefox adds to the word entered if Fixup is enabled. The suffix that Firefox adds to single words entered if Fixup is enabled. If passwords entered in the address should be included in the "Fixit" operation as well. Defines whether Firefox will save text entered into web forms. False: The data won't be saved. Defines if Firefox should remember visited pages. False: History will not be recorded. Defines if Firefox is started in private browsing mode on start. False: Firefox is started normally (default). True: Private Browsing mode is used automatically. True: Firefox will check urls and block them if they are forgeries. False: Firefox will not run those checks. Whether Firefox will use malware information to determine if downloads are malicious. False: Won't download malware information or scan downloads. Defines the name of the (installed) search engine that is used for searches in Firefox (both address bar and search bar). Yahoo: The default value (may be different depending on your region). Defines whether search suggestions are displayed in Firefox. True: Search suggestions are displayed (default). False: Search suggestions are disabled. Determines whether the Heartbeat feedback feature is enabled in Firefox. True: Feature is enabled and short feedback surveys may be displayed (default). Informs servers about links that get clicked on by the user. False: Pings are not enabled. The number of previous pages that Firefox keeps saved for every open site in the browser (back and forward functionality). Defines the homepage of the browser. This defines how Firefox will start up. 3: resume the previous browser session. Whether Firefox will display auto-complete suggestions when you type in the address bar. False: Auto-complete won't be used. Defines whether scripts can close windows in the browser. True: Scripts may close any window. Gives web applications access to the battery status of mobile devices. May be used in fingerprinting techniques. True: Allows web applications to retrieve the battery status (default). True: Scripts are allowed to change images. Defines whether Firefox's built-in popup blocker is enabled. Several preferences that determine if and how scripts may manipulate browser windows. Determines whether websites are allowed to access clipboard contents (check out: Block websites from reading or modifying Clipboard contents in Firefox for additional information). Determines whether websites are allowed to block access to the right-click context menu. False: Web pages won't be allowed to manipulate or block the context menu. False: Plugins are not run out-of-process with the exception of plugins listed by dom.ipc.plugins.enabled.name preferences if set to true. The time in seconds before out-of-process plugins are terminated if they are not responsive. 45: the time in seconds. Defines the time a script may run in the browser. Default values are 20 and 10. 0: means the scripts are allowed to run forever. The maximum number of popups that can be spawned in Firefox. This parameter defines whether "client-side session and persistent storage" capabilities are enabled in Firefox (meaning if the feature can be used by websites and applications to store data on the client computer). True: Client side storage is enabled. False: The feature is disabled. Firefox ships with a remote killswitch for extensions and plugins. It is highly recommended to keep this at its default value as it was used in the past to block malicious extensions. True: The blocklist feature is enabled (default). False: Mozilla cannot turn off extensions or plugins remotely. This sends a daily ping to Mozilla about installed add-ons and recent start-up times. True: Sends the ping to Mozilla (default). False: Blocks it. This turns off add-on recommendations and won't update add-on metadata (the description) anymore). Defines whether extension updates are enabled in Firefox. True: Firefox checks for updates regularly (once per day by default as determined by extensions.update.interval. False: Firefox won't check for extension updates. Determines if location aware browsing is enabled. False: The feature is disabled which means that you won't get prompts on websites using it. Defines whether geolocation requests are logged by Firefox. False: Requests won't be logged. This preference determines whether WebRTC is enabled in Firefox. WebRTC is used for telephony and video chat functionality but leaks local and remote IP addresses as well. May also be used in browser fingerprinting. True: WebRTC is enabled (default). False: WebRTC is disabled. Note: you need to set loop.enabled to False as well. Provides web applications with information about video playback statistics such as the framerate. True: Web applications can access statistics (default). False: Statistics cannot be accessed. Determines whether Firefox will accept so-called session cookies (removed when browser exits) automatically. Depends on network.cookie.lifetimePolicy set to 1. True: Firefox will accept session cookies. Defines if cookies are allowed in Firefox. 0: All cookies are allowed. 1: Only cookies from the first-party server are allowed. Defines the number of days that cookies are stored by Firefox if network.cookie.cookieBehavior is set to 3. This defines when cookies expire in Firefox. 1: Firefox prompts the user (unless network.cookie.alwaysAcceptSessionCookies is set to true). 2: Cookie expires at the end of the session. 3: The cookie lasts for the days specified in network.cookie.lifetime.days. Defines how many entries Firefox will keep in the browser's DNS cache. 400: the default number of cached DNS entries. The time cached DNS entries will be saved by Firefox. Defines when to set the referrer (the page a visit originated from). 1: only send if the base domain matches. Whether the real or a fake referrer is used by Firefox. Defines whether the referrer is trimmed or not. 0: send the full URI (default). Controls when to send the referer header and document.referrer is set. 0: Never send the Referer header or set document.referrer. 1: Send it after clicking on links. 2. Send if after clicking on links or loading an image (default). Defines whether a Referer header is sent when you are navigating from one secure site to another. True: The Referer header is added to connections (default). False: The Referer header is not added. Defines whether Firefox caches http requests. False: Disables the caching of http requests. Defines whether Firefox will accept link prefetching directives by websites. A component of Firefox's Necko Predictive Network Actions feature that improves page load time by performing overhead for connections before the connections are actually needed. True: The feature is enabled. Scans the Windows Registry key for plugin references. If found, adds them to Firefox. True: Will scan the Registry. The default state of the Flash plugin. 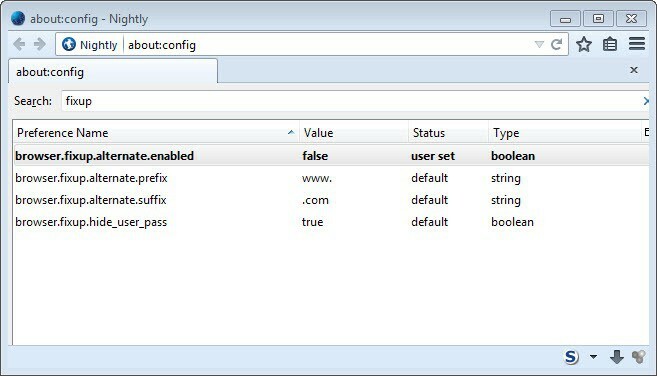 See How to make sure Firefox plugins never activate again for more information. 0: turns off the Flash plugin in Firefox. 1: sets the Flash plugin to ask to activate. 2: enables the Flash plugin. The default state of the Java plugin. 0: turns off the Java plugin in Firefox. 1: sets the Java plugin to ask to activate. 2: enables the Java plugin. Defines which sets of data get cleared when Firefox shuts down. A value of true means the data set is cleared on exit, false that it is kept. Defines the items that are selected automatically when you bring up the Clear Browsing Data dialog (using Ctrl-Shift-Del for instance). True means the data set is selected, false it is not. Sets the Do Not Track header which informs websites and services about the tracking preference. True: Do Not Track Header is used. Whether the browsing history is automatically cleared on shutdown. False: It is not cleared (default). Defines whether Firefox's Tracking Protection feature is enabled. False: Tracking Protection is disabled. Defines if OCSP Stapling is enabled in Firefox which determines how certificate information are retrieved (check Firefox 25 gets OCSP Stapling which improves privacy for detailed information). Defines the minimum and maximum allowed version of SSL or TSL when communicating with encrypted servers. Setting it to 0 is not recommended because of known vulnerabilities. The guide provides you with detailed information on some of the most important security and privacy preferences of the Firefox web browser.